Overall, a "better than feared" reporting season helped drive the S&P/ASX 200 Accumulation Index to gains of 6.0% during the month of February. This was despite earnings downgrades of ~2% across ASX200 companies. The counterintuitive outcome suggested investors’ expectations were reasonably bearish heading into the reporting season. Much of the concern came as the result of several companies pre-releasing results during January, with the majority providing negative updates. Against these expectations, results were broadly positive. However, as always there were hits and misses aplenty, many of which were met with explosive price moves. Capital management remained front and centre this reporting season with many companies opting to return capital to investors. Companies with excess franking credits were the standouts, with several of these companies distributing or planning to distribute these credits to shareholders ahead of the upcoming Federal election. Special dividends were the preferred means by which to distribute capital back to shareholders. Resources companies led the way, with excess free cash flow being generated by strong commodity prices and modest capital expenditure needs. Rio Tinto (RIO, +10.5%), South 32 (S32, +10.8%) and Fortescue (FMG, +10.6%) all announced fully franked special dividends during February. Meanwhile, domestic focused industrial companies with strong franking balances also announced fully franked special dividends. This included Wesfarmers (WES, +6.1%), Flight Centre (FLT, +6.4%), and Telstra (TLS, +2.3%). 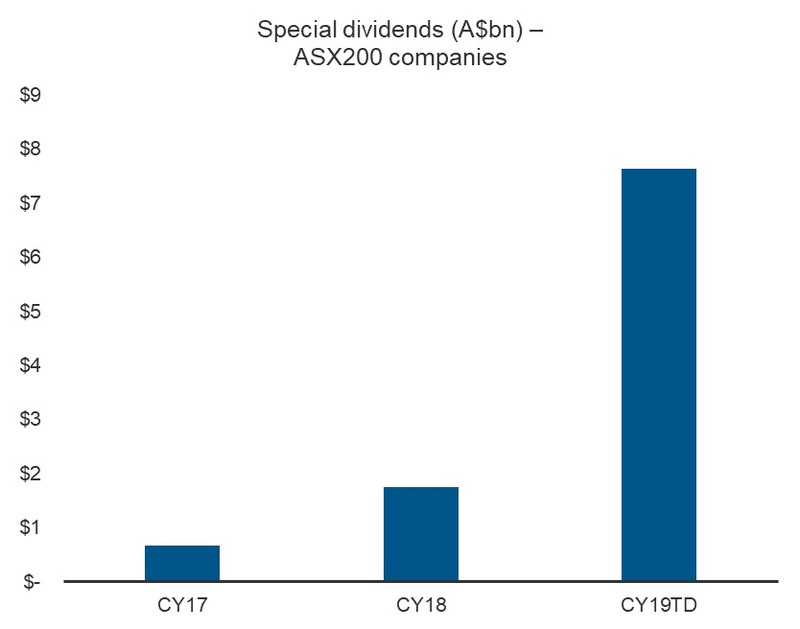 The chart below indicates just how significant the increase in special dividends was for the ASX200 this reporting season. Companies also have an opportunity to distribute excess franking credits to investors through off market buy backs. Caltex (CTX, +6.5%) has recently announced a ~$260m off market buyback. We may see additional off market buy back in the near term as companies come to terms with the uncertainty around franking credit eligibility in the event of a change in government. Following very strong performance during the August 2018 reporting season, the Information Technology sector again delivered strong returns during February. High profile small cap tech stocks led the gains with impressive results from Appen (APX, +46.9%), Altium (ALU, +32.3%) and Bravura Solutions (BVS, +21.9%). However it wasn’t all plain sailing, with cyclical headwinds impacting some traditional internet stocks, such as Carsales.com (CAR, +0.6%). Domestic new car sales data continues to trend down, which is weighing on display advertising. The Big Four banks enjoyed a relief rally following the release of the banking Royal Commission’s final report in early February. However the subsequent earnings results from regional banks Bendigo and Adelaide (BEN, -8.5%) and Bank of Queensland (BOQ, -11.4%) highlighted that operating conditions remain challenging. Banks continue to face revenue headwinds from lower credit growth, and margin headwinds from higher regulatory and remediation costs. Additionally, with bad debts close to cyclical lows, earnings growth is likely to be modest at best. A key focus for investors during February was the assessment of increasing headwinds on consumer facing businesses, such as discretionary retailers. Weaker house prices, particularly in Sydney and Melbourne, were generally expected to weigh on consumer spending, due to the negative “wealth effect”. Additionally, the looming NSW State government election (March) and Federal government election (May), were also expected to create some uncertainty. Despite these headwinds, company commentary was generally more upbeat than market expectations. This may be explained by the ongoing strength in employment, which combined with low interest rates, continues to support consumer activity for now. Companies which confirmed positive, albeit moderating, consumer activity included Wesfarmers (WES, +6.1%), which owns Bunnings, Kmart and Officeworks. Leading airline, Qantas (QAN, +5.3%), noted that forward bookings were up a solid 6.8%, with leisure bookings on Jetstar tracking strongly ahead of the Easter school holidays. Meanwhile, domestic casino operators, Star Entertainment (SGR, +2.4%) and Crown (CWN, -4.1%), both confirmed ongoing growth in their main gaming floors, in Sydney and Melbourne respectively. Although reporting season was generally better than expected, consensus earnings forecasts for FY19 were further reduced. 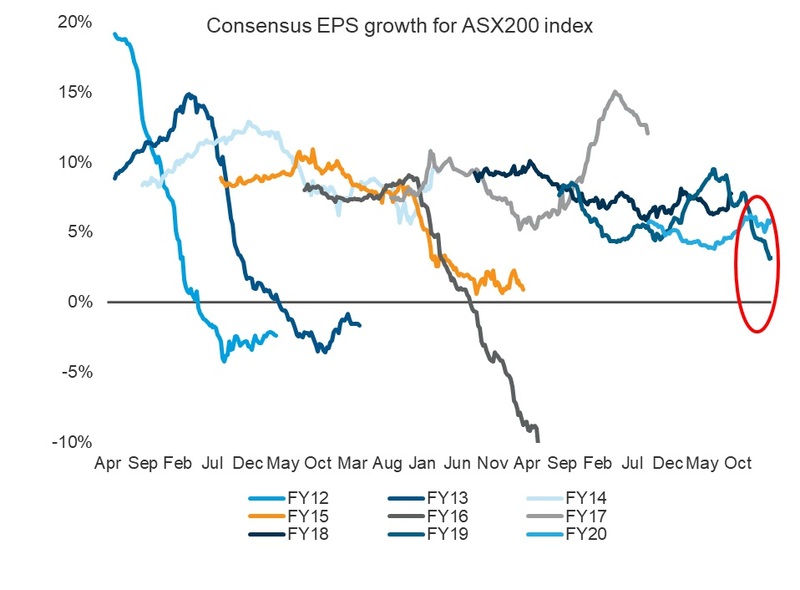 Earnings per share (EPS) growth remains positive for the ASX200 index, but remains supported by the Resources sector, which is benefiting from higher commodity price forecasts. Outside of Resources, FY19 market forecasts have been downgraded, consistent with prior year trends. Additionally, with several companies guiding to a better second half, downside risk remains. The chart below shows the continued downward direction for the FY19 earnings forecasts for the broad ASX 200 universe. The key themes of the February reporting season are not new to the Australian market, however we are aware that they are front of mind with investors. We continue to monitor these closely as part of our investment process. Their evolution over the coming months will be critical for the performance of stocks, sectors and factors exposures. We believe that domestic economic conditions remain broadly supportive and the Australian equity market continues to offer opportunities for investors, noting an increasing divergence in valuation between segments of the market.